During the first quarter, the S&P 500 index recorded an increase in value of 13.1%, which was the largest quarterly increase since Q3 2009 (+15.0%). 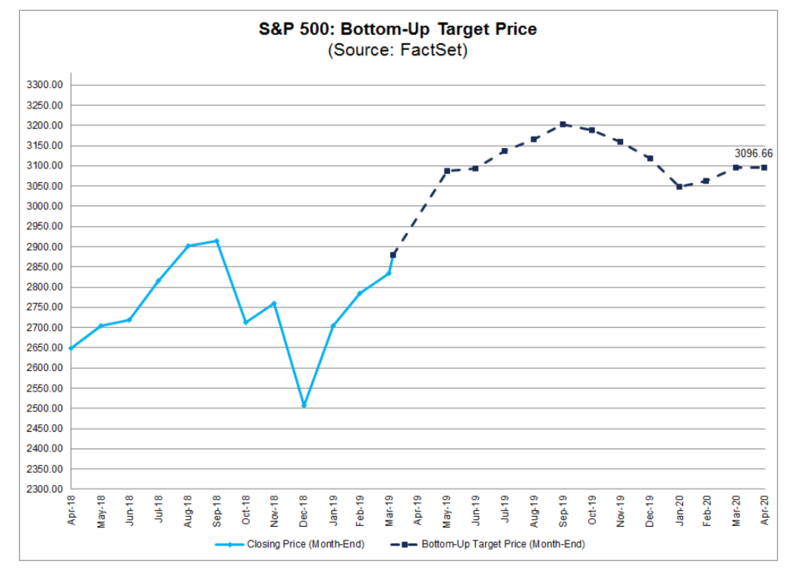 Industry analysts in aggregate predict the S&P 500 will see a 7.5% increase in price over the next twelve months. This percentage is based on the difference between the bottom-up target price and the closing price for the index as of April 4. At the sector level, the Energy (+13.5%) and Health Care (+11.7%) sectors are expected to see the largest price increases, as these sectors had the largest upside differences between the bottom-up target price and the closing price on April 4. On the other hand, the Real Estate (+1.4%) and Utilities (+2.4%) sectors are expected to see the smallest price increases, as these sectors had the smallest upside differences between the bottom-up target price and the closing price on April 4. What Does an “Inverted Yield Curve” Mean?